Police were called to reports of strange behaviour in Corrientes, Argentina, where they supposedly snapped the other-wordly being on a mobile phone. Terrified teenagers alerted the authorities and reportedly pointed them towards the alien in a park. The creature then fled into a nearby river where officers lost track of it, Express.co.uk reports. But things might not be entirely as they seem. 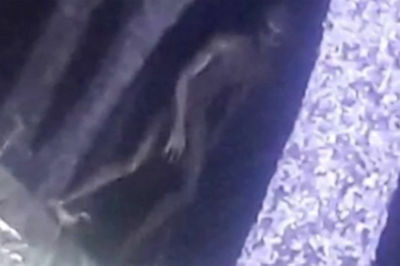 Debunkers have already branded it a CGI hoax, saying it is an edited version of an alien shown in the ET film Signs, starring Mel Gibson, or a still from Spanish alien horror flick Ovni. Despite this, conspiracist Terry Larch wrote: “This photograph is incredible and may be the best evidence of aliens living among us yet. “Once the police arrived, they wandered over slowly, approaching this strange thing. “They soon realised that this was no human but something else entirely. Larch was taken aback by the alien’s features and striking appearance. He added: “The shape and size of the alien is rather remarkable to see. “It has the oval head shape and almond dark shaped eyes. Its hands appear to have only three fingers protruding outward.